It's not every day that we get to announce a new product that is so timely! GDPR, or the General Data Protection Regulation, is the European Union's new privacy rule meant to protect consumers and their data. One explicit byproduct of this legislation is that email marketers, especially those who have purchased or otherwise mined contact information, must acknowledge that the email is cold and allow for an opt-in process when the prospect lives in the EU. Also pertinent to job change tracking is that if permission is given when a prospect worked at one company, that permission does not transfer when they move to another company. The compliant way to use TrackJobChanges's job change tracking data on EU residents is to request permission again after the job change. Yes, it's a lot of work, but that's the point of GDPR. They want to put a curb on email marketing by bringing it out of the shadows and into the daylight. However, like I said, this only matters if the prospect is in the EU. Everywhere else in the world is still fair game so long as you abide by the decidedly less stringent CAN-SPAM laws in the US and similar laws elsewhere. You certainly don't need to request for these opt-ins and risk being fined for up to 4% of global revenues. Wouldn't it be nice if there was a way to separate the EU prospects into a different pool to send them the opt-ins and non-EU prospects to get the business-as-usual approach? Fortunately, now there's a way: TrackJobChanges's new In EU? API flag. 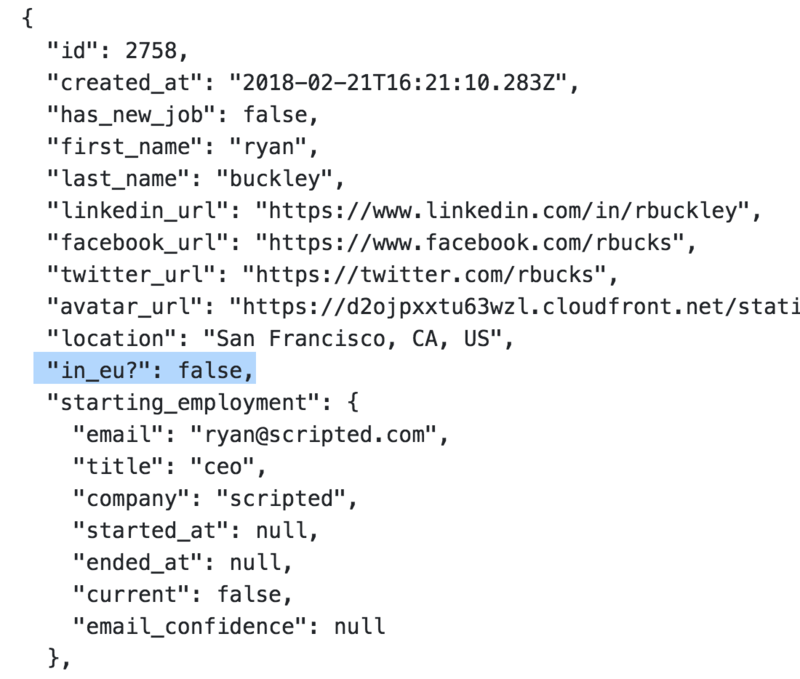 On all exports and API calls Inlistio now returns a boolean (TRUE/FALSE) field showing whether or not we believe that person works in the European Union! Simply upload a list of new connections, use our Salesforce CRM integration, or create a new connection via the TrackJobChanges API and along with the other job change data we'll return will also be an In EU? boolean which you can use to do this segmentation. It's live now! Give it a try.